A visitor tries to get a closer look at an Escher lithograph at The Hague's "Escher in the Palace" exhibit. Escher was a prolific graphic artist. During his lifetime, he created more than 2,000 drawings and sketches, and nearly 450 lithographs. He also illustrated books and designed tapestries, drew postage stamps and created murals. Although Escher is best known for his more imaginative works, in the early part of his career his art was more realistic, depicting landscapes and architecture taken directly from what he saw as he traveled throughout Italy. He used these sketches as the basis of his lithographs, woodcuts and wood engravings. Even though his early works were more rooted in reality, many of them included bizarre and almost surreal elements, such as his 1932 rendering of mummified bodies in a church in southern Italy, or the floating castle in his 1928 woodcut, "Castle in the Air." His early works already held a sense of his fascination with spatial structure and relationships, which would become intrinsic to his work in the latter part of his career. In addition to his preoccupation with architectural forms, Escher was fascinated with shading and the contrast between black and white, as well as with mirror reflections. In 1929, he experimented with scratch drawings, which he made by coating parchment with printer's ink and then drawing on its surface with a pointed instrument. This technique led him into lithography, a method of making prints from a stone surface. The period after Escher left Italy in 1937 marked the beginning of the second phase of his career. Escher didn't travel throughout Switzerland as he had in Italy. He found the cold, mountainous Swiss landscape uninspiring. From this point on, his works were derived less from the world around him than from the world inside his head. 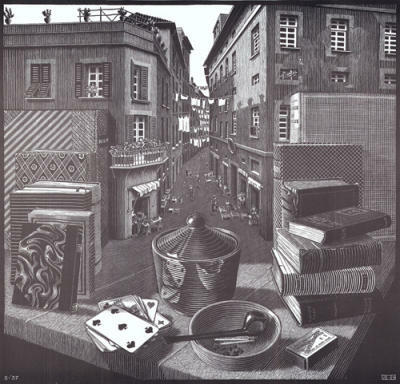 He began combining realistic and illusionary elements in his works to create unorthodox compositions, such as the street rising out of a table in his 1937 woodcut, "Still Life and Street." Escher also experimented with repeated patterns of geometric shapes (called tessellations), seeing how they fit together. In some of his works, he turned these abstract patterns into recognizable figures. In "Metamorphosis I," a Chinese man transforms into an Italian town. You can take a look at "Still Life and Street" and "Metamorphosis I" here and here. Escher was a master at implementing the principles of mathematics and spatial reality -- creating images in which the individual parts seem logical and plausible, but when the image is taken as a whole it is obviously impossible. Examples of this technique are "Other World" from 1947, in which the far wall is simultaneously the ceiling, and the aforementioned "Ascending and Descending," in which monks climb and descend stairs endlessly without going anywhere. For more information on the world's great artists, please see the links below. Ernst, Bruno. "The Magic Mirror of M.C. Escher." New York, NY: Barnes & Noble Books, 1978. Locher, J.L., ed. "The World of M.C. Escher." Amsterdam, Netherlands: Meulenhoff International, 1971. Schattscheider, Doris. "The Tessellating World of M.C. Escher." Odyssey, November 1999, Volume 8, Issue 8, pgs. 18-20. Scholastic Art. "Endless Images." November 2000, vol. 31, issue 2, pgs. 4-5.